I COULDN&apos;T HELP BEING EXCITED, AND CONCERNED. WE WERE driving north on Interstate 5 toward Bellingham, Washington, for the boating challenge of a lifetime. It was snowing as we crossed high ground at Lake Samish, and, better yet, the trees were dipping in the wind. This will be perfect, I thought. Snow and hearty gusts would be our companions as we took a team of boaters and a matched pair of trawlers for a duel among the floats, pilings and boat sheds of Bellingham&apos;s Squalicum Harbor. The yachts: a pair of 36- foot Grand Banks classic trawlers. They looked alike, but one harbored a secret. It had only one engine and a bow thruster, a small propeller turning in a tube through the hull near the bow and just below the waterline to help control boat movement in close-quarters maneuvering. The second had the usual pair of diesels in the engine room. Once and for all, we were going to try to settle the issue. Which is best-a single (with thruster) or a twin? Hard pellets of snow were smashing into the windshield and collecting on the trees along the roadside, and I imagined a scene in the harbor: a lookout standing on the bow of a GB, coated in snow, shouting instructions to a skipper trying to land alongside a float he or she couldn&apos;t see in a gale wind. That will prove something, I thought. Probably that we are crazy. Twenty minutes later, as we pulled into a marina parking spot, the snow had nearly stopped. The wind, though, still was gusting to 30 knots. We knew that because the door at Grand Yachts Northwest (the region&apos;s GB dealer) kept blowing open, and it only does that when the wind reaches 30. After a brief team meeting, the snow was gone and the northeast wind from Canada had weakened. We were ready to go. Although a lopsided majority of all the vessels that go to sea are powered by one engine, it seems that single-engine yachts cruise under a stigma: They are slow, subject to devastating engine failure at any moment, hard to maneuver in close quarters and, well, just not quite right. Twin-engine boats, however, enjoy a reputation of being powerful, fast, reliable and as easy to dock as it is to park the family car. And they seem sexier, sharper, more desirable. That&apos;s all nonsense, of course. But the questions won&apos;t go away: Is a twin better than a single? Is a single harder to handle in a marina? What justifies buying a twin? And the list goes on. PMM decided to find the answer. 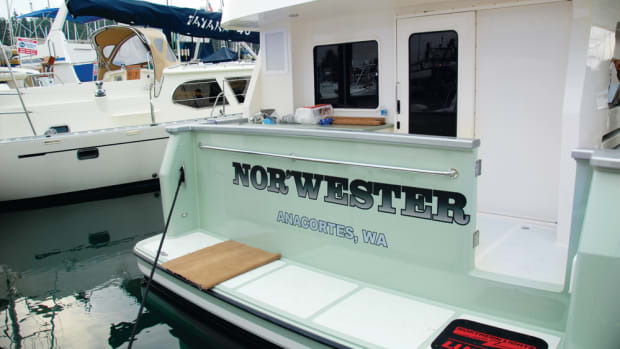 Kathleen Wesson, charter fleet manager for Grand Yachts Northwest, helped me find two boats, identical except for the iron in their engine rooms. Tim Mumford, proprietor of a marine canvas business in Bellingham, contributed MoGeo, the single. Terry and Carolyn Blocher, also of Bellingham, own Spellbound, the twin. Others signing on to help with the assessment were William ("Doc") Keith, a waterfront veteran and a checkout skipper for Grand Yachts Northwest, and Mark Walters, a Bellevue, Washington, resident who owned a fast, gasoline-powered small boat years ago and is looking for his next boat. Mumford was recovering from a back injury and chose not to go boating, but provided MoGeo and recruited a friend, Roger Schjelderup, owner of a Bellingham marine service and a skilled boat handler, to watch over his Grand Banks. Schjelderup has a young family and a demanding business. So, right now, his boat of choice is fast and gasoline powered. When the time comes for serious cruising, however, he vows it will be in a trawler. "Like this one," he says, patting MoGeo&apos;s steering wheel. Also with us was Greg Gilbert of Seattle, owner of Winifred, a 47-foot Lake Union Dream Boat built in 1926. She has a single engine, no thruster. Gilbert, a professional photographer, took the wheel of Spellbound to see if he had missed something in years of owning a single. He also took some of the photographs accompanying this article. We had counted on another would-be boater who is undecided on the issue, but schedule conflicts prevented his participation. With this team we would answer the question, once and for all. Mumford&apos;s Grand Banks backs to the right, even with the rudder centered or hauled left, and Roger demonstrated how to take advantage of that quirk of physics as he turned the boat around in a narrow fairway. A bump on the thruster switch pushed the bow away from the float, and the stern began moving to our right as he slipped the engine into reverse gear. We were below the seawall, and whatever wind was left was well overhead. When the boat was perpendicular to the float, Roger kicked the bow to the left with the engine and rudder and then dropped into reverse to pull the stern farther around in the opposite direction. Soon he had completed a 180-degree turn, and we were pointed out of the moorage. Terry Blocher was first up. A few years ago, he and Carolyn decided they wanted a boat. Not knowing much about boating, they thought it would need to be a big one. So they looked at a 63-footer and decided that was too much. They chartered a 46 GB from Grand Yachts Northwest and liked it, but concluded it also was more than they needed. Finally, about two years ago, they bought their 36. This was Terry&apos;s first time at the wheel of a single-engine boat. He steered it easily down the fairway, made a 90-degree left turn and headed toward a large open area to practice backing, turning and doing a 360. The wind still was with us, with gusts to 20 knots estimated. Terry praises his wife&apos;s skill at the wheel. "Carolyn has a better sense of where she is with the boat, and she&apos;s better at handling it," he says. On his own, Terry used the thruster, the rudder and gears in making his turns. His first attempt to make a 360 spin to the left was a bit sloppy. But MoGeo&apos;s path tightened up on subsequent tries. With Roger at his elbow offering advice, Terry turned the boat into the wind and attempted a right-side landing at the end float of a row of finger piers. A 38-foot Bayliner occupied the forward half of the float. Terry is accustomed to docking Spellbound by steering with her twin engines throttled back to idle speed. Using that slow approach, MoGeo stopped short of the float, and the wind began to push her out of position. At that point, the bow thruster could not save the day. Coach Roger advises the team: "You can&apos;t control the boat with the thruster unless the engine is in gear. Put it in gear and get it under control first. You never want to lose control of a single because you never can regain it." At Roger&apos;s suggestion, Terry used more engine speed, the reverse gear and a touch of the thruster to bring the boat neatly alongside on his second try. "That&apos;s the biggest difference," Terry says while the boat rests against the float. "You can&apos;t control it as well with the engine at idle." In an assessment after the maneuvers were complete, he adds: "I did not feel I had nearly as much control of the boat compared with twin engines." Years ago, Mark Walters owned a 28-foot Fiberform. Now, he&apos;s considering returning to boating and is trying to decide whether to buy a single-with-thruster or a twin. On his first attempt to moor MoGeo, Walters came up about 8 feet short of the float. The second time, with Roger coaching, he made a perfect landing. "The dead-on head wind helped," he says. Walters said it took a couple of tries to find the right touch with the bow thruster control. Turning in reverse was troublesome on his first try, but Walters thought that with more experience and coaching he would be OK in that maneuver, too. He worked the boat without the thruster and found that handling was "slightly easier" than he anticipated. "With the thruster it was much easier to handle than I had expected. I don&apos;t think I&apos;d have any trouble learning this," Mark concludes. "But I certainly would want to go out with a professional skipper a couple of times." At lunch, he told Polly he was thinking about buying a Krogen. With her husband&apos;s praise for her ability something to live up to, Carolyn Blocher took the wheel. Carolyn has Chapman&apos;s on her computer and studied its chapter on operating single-engine craft to prep for our Bellingham outing. She was ready. More aggressive than others had been, she easily revved the 210-horsepower Cummins engine when she thought MoGeo needed a little more push. Carolyn practiced turning and backing in the open fairway, and the yacht responded quickly to her positive action with rudder and throttle. Then she took a shot at landing behind the Bayliner. With Roger offering quiet hints, and despite continuing gusts of wind, Carolyn moored the GB as easily as she parks her car at home. "That&apos;s perfect," Roger says in praise. He jumped over the rail onto the dock to hold the boat steady while the team reviewed the landing. Worried about his departure, Carolyn calls to Roger: "Hey, get back on board. I don&apos;t want to lose you!" Roger pushed off and jumped aboard and Carolyn took MoGeo back to her slip, making a good portside landing. The helm on the GB is to starboard and a port landing is difficult the first few times simply because it is hard to see how close the bow is to the dock. "I didn&apos;t know what to expect," she explains later. "But it worked! I found it easier than I thought it would be. The boat handled well, with not a huge difference. It&apos;s still forward and backward, turning the rudder for direction. "Everything worked just as they said it would, but I can&apos;t say I&apos;m satisfied after only three dockings with an instructor at my elbow." She operated the boat briefly without using the thruster and had no strong opinion about that pure state of boat handling. "I think of it (the thruster) as a &apos;fail safe&apos; in a tight situation, and that gives me confidence," she says. Despite her husband&apos;s position on twins and her own limited experience, Carolyn gave the single-with-thruster at least one thumb up. "As I&apos;ve talked to more single-engine captains, I&apos;ve opened my thoughts to at least consider having a single," she says. A vote (sort of) for the single. The thrusters you&apos;ll find on a 36 GB or other similar yachts are powered by small electric motors. While MoGeo has an 8-inch propeller in the fiberglass tube in her bow, thrusters come in an amazing array of sizes and horsepower. Vetus Den Ouden, for example, offers an electric thruster as small as 4-1/2 inches in diameter (offering 55 foot-pounds of force) and others up to nearly 12 inches in diameter (and with 488 foot-pounds of thrust). Its largest hydraulic thruster produces 665 foot-pounds of push. Most electric thrusters will not save your skin in a big wind or in a surging tidal current; they just don&apos;t have the horsepower. If you work them too hard and too long they will overheat and pop a circuit breaker. They provide the brief, firm touch needed to hold the bow steady while you&apos;re coming alongside a float, or to help move the boat away from a moorage. They are not intended to move the world. On Richard Friedman&apos;s Explorer, the thruster is powered by a huge hydraulic pump and system containing many gallons of fluid. He can operate that thruster for long periods without fearing a shutdown because of overload. 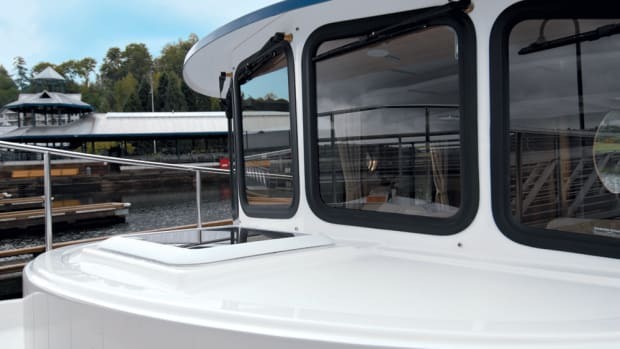 After backing the big boat around the end of a float, down a fairway and into a moorage-using only the thruster most of the way and the boat&apos;s natural tendency to back to the right-the tank of hydraulic fluid is hot to the touch. It takes a lot of energy to push 90 tons of boat into the wind. Hydraulic systems are far more expensive than electric, but they are seen on larger yachts on which the steering, windlass, dinghy davit and thruster all are hydraulically powered. Obviously, the primary financial benefit of the single-with-thruster combo comes from having one engine. Order a 36 GB with a single engine today and it will cost about $30,000 less than one equipped with two. A single 42 GB would cost $35,000 to $40,000 less than a twin, depending on the engines chosen. Electric bow thrusters require little maintenance, as long as they are not overheated and cooked by inexperienced operators. Kathleen Wesson, the charter boat fleet manager, says she sees few problems with thrusters. Adding a thruster to a boat like a 36 Grand Banks will cost roughly $8,000. Order a new GB and the factory will mold in the tube, and the thruster will be installed during commissioning. The savings available by ordering a singleengine boat will pay most of the cost of heating or air conditioning and a package of electronic systems. Over years of ownership, a singleengine boat with a thruster will cost tens of thousands of dollars less to maintain, repair and fuel than one with a pair of diesels. Bow thrusters can be added to most boats later in life. Friedman&apos;s Malahide was fitted with its bow thruster long after launch, a process that required jackhammering away concrete ballast in the bilge and reframing hull timbers. It&apos;s easier with fiberglass boats, assuming space is available. Insurance industry sources report that underwriters see no difference between singleand twin-engine boats when it comes to setting rates. Despite that, the underwater gear on a single obviously is well protected by the keel and skeg, while the propellers and shafts on a twin are exposed and more vulnerable to damage. Then there&apos;s the question of speed. Old boats, like the 1979 GB Polly and I own, go only marginally faster with two engines than one. That&apos;s because they have slow-turning, low-horsepower engines. Today, a semi-displacement yacht with twin engines can be very fast. Grand Banks has proved that by loading high-horsepower diesels into its boats and converting them from sedate 8-knot craft to speedsters that will approach 20 knots. But the singles can zing, too. Camano, for example, puts one diesel into its 30-foot boat, and lightly loaded it will keep up with the fast GB. It also is happy cruising slowly. Nordic Tug puts large single diesels and bow thrusters into Lynn Senour-designed hulls that cruise efficiently at 8 knots or 15. American Tugs also follows this practice. Grand Banks yachts with singles reach speeds in the teens on a single engine. So a single-engine cruising boat can be made to go fast enough. Speed, or a lack of it, should not be an issue. If I were buying a single-with-thruster I think I&apos;d turn the thruster off and learn how to handle the boat without it. Then I would treat it as a friendly helping hand, to be used when something extra is needed to make a safe landing. In talking with experienced single-withthruster owners later, I learned that reliance on the thruster drops as the owner&apos;s boat-handling skills improve. Instead of counting on the thruster for help, they have learned how to make close-quarter maneuvers simply using the rudder and engine. I asked one such skipper about his use of a thruster after several years of boat ownership. After a moment of thought, he said he now uses the thruster mainly to hold the bow steady while backing into a mooring space. That&apos;s because bow thrusters are helpful, but not infallible. As Friedman explained in our team meeting, you&apos;ve got to know how your boat handles and how the wind and current will affect it as you maneuver in close quarters. Having a bow thruster won&apos;t save you from a catastrophe if you misjudge either. After years of experience, he knows when it&apos;s safe to back around a dock end and down a narrow fairway to a mooring spot-and when it isn&apos;t.
Learning to use a single-engine boat, with or without a bow thruster, is as much about being able to identify environmental conditions that have the potential to mess up a landing as it is to know how to back and turn. This can be particularly complicated on tidal waters, where boaters may confront wind from one direction and a current flowing some other way. The same lesson is true for a boat with two engines. A second engine is not a substitute for experience, knowledge and an ability to read current and wind direction. A good wind will blow the bow of a twin-engine boat away from the dock and sabotage a landing quickly. I know. No one on our team confessed to any serious fear about relying on a single diesel, an enlightened attitude for sure. Consider how many popular yachts have only one engine: Krogen, Nordhavn, Monk, Nordic Tug, Pacific Trawler, American Tug, Eagle and Camano are among the better known singleengine production yachts that usually are fitted with a bow thruster. Add to that the scores of custom and semi-custom yachts built every year with just one engine. Single engine boats represent a major part of the recreational boating market; they must have something good going for them. Polly and I have been running our 42 GB Europa for more than 12 years. We bought it more for its style and space than for twin diesels, although I recall anticipating the easier maneuvering they would provide. Before buying Quadra we owned two singleengine diesel boats for about 10 years. In more than 20 years of diesel-boat ownership, we never have experienced an engine shutdown caused by the failure of an internal engine component. We lost a drive plate on the middle boat, but the engine continued to run. The boat was dead in the water, however, and we needed a tow. We have had to shut down the port engine on Quadra twice, once when a V belt broke and once because of a leaking heat exchanger. Those were maintenance problems-and my fault-and in both cases the engine was running again in less than an hour. Dirty fuel stopped the single diesel in our middle boat too many times, but that was a long-term maintenance issue we inherited with the boat, not an engine fault. I can tell you that your heart stops the first time a single engine quits for no apparent reason far from shore. Diesels installed in Grand Banks and other trawlers built in the mid-1960s continue to run reliably today. A veteran diesel technician once told me that a properly maintained diesel engine should never wear out in pleasure boat use. The problem, he said, is that owners break them through misuse and neglect. Given good care, it&apos;s unlikely an engine ever will conk out unexpectedly. Modern marine diesel engines, properly maintained, run for years without problem. That point needs to be shouted out again: Engine reliability should not be an issue in considering the purchase of a single-engine boat. Some custom and semi-custom boats are fitted with emergency get-home systems just in case the main fails. It may be a separate, small wing engine driving a separate shaft and propeller, or it can be a hydraulic drive (powered by the generator) turning the main shaft. Surveys by PMM, however, suggest that those back-up systems seldom are used. I recently toured a 65-foot displacement trawler yacht under construction in British Columbia. The owner intends to cross oceans and circle the world with the boat. It has a range of more than 7,000 miles and, obviously, carries a lot of fuel. But it has only one engine, and no get-home system. That&apos;s confidence. We should have asked Jon and Mary Magill to join us in windy Bellingham. 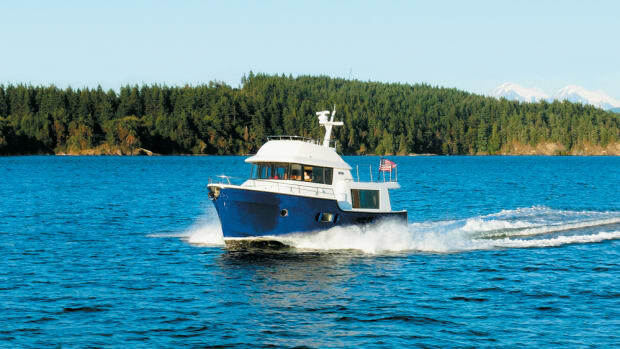 The residents of Whidbey Island (not too far south of Bellingham) recently took delivery of a new 42-foot Grand Banks equipped with a single 375-horsepower John Deere engine and a bow thruster. They previously had owned a 36 GB with a single engine, and there was no other choice but another single when they went shopping for a larger boat. In his analysis of the issues before purchase, Jon dealt with questions that came up during our sea-going duel. The three principal factors leading to their choice of a single: the protection afforded the running gear by the keel in a single, average anticipated cruising speed and space in the engine room. "When I first compared the two visually, the amount of exposed running gear under a twin made me nervous," he says. "Intuitively, the small rudders also look less effective." Jon and Mary like to cruise at hull speed, which is between 8 and 9 knots. "Given that, having another engine, with both running at something less than optimum revolutions per minute and load for extended periods of time, just didn&apos;t make sense to me," he adds. "Diesels like to be run under load and our cruising speeds would not produce enough load in my mind to justify twins. A reasonable single can easily propel the boat efficiently in the cruising speed range." Although they prefer slower speeds, their new 42 will do much better than that. In his research, Jon studied manufacturers&apos; data and speed curves. "According to this data, a single 375 would do better than twin 210s or twin 225s. The Deere topped out at 12.2 knots (at 2,450 rpm), rather than the possible 16 knots listed for the single Cat 375 (at 2,800 rpm)." If one is looking for speed, he believes, the focus should be on twins. "If you want a lot of speed, you&apos;ll buy big twins. If you want more speed, hopefully you&apos;ll buy a different style of boat. "In a GB (or any other similar hull), it takes a huge amount of additional power to get significant speed increases. My decision to go with the Deere 375 was influenced by a desire to have good cruising power, but also a little extra speed if and/or when it might be needed," Jon said. Breakdowns, he determined, are the result of fuel-related problems, trouble with running gear and mechanical or engine-related failures. Between 80 and 90 percent of boats that go dead in the water do so because of fuel problems, he says. "If fuel is the main problem, then I am no worse off than anyone else." To eliminate that most common reason for breakdown, Jon installed a fuel-polishing system "to ensure clean fuel at all times." The Magills don&apos;t worry much about engine reliability. They do carry a full supply of spare parts and Jon acknowledges, "I am maniacal about maintenance." Should the engine fail, he reminded me of a get-home trick I once observed but had forgotten about. He will lash his dinghy alongside, start its motor and head for port. The outboard on the dinghy will provide steerage speed for the bigger boat. "This is far from optimal in rough weather, but it still is an option." Finally, Jon says: "I love our engine room. Not to say that I&apos;m claustrophobic, but being able to reach both sides of an engine room comfortably makes working much easier. I can move along both sides of the engine and engine room. I think I have a lot more space and elbow room than anyone with twins." MoGeo securely tied, we walked across the marina to the twin-engined Spellbound. Doc Keith joined us to provide the coaching and guidance Roger had offered earlier. There&apos;s no question about Keith&apos;s views. He likes singles. Carolyn Blocher jokingly said Keith believes a bow thruster "is a sin." Calling on his earlier experiences with a gaspowered twin, Walters drove the GB out of its slip, spun a 180 and backed in. Easy. Keith then directed him out into the fairway for an exercise he developed to test the skills of charter customers. He asked Walters to stop the boat a safe distance off the end of a float and then directed him to turn a 360 without changing the boat&apos;s position relative to the end of the dock. He passed the test easily, saying that his experience with the bow thruster on MoGeo that day made him wish for one on Spellbound. Aside from discovering the ease of handling a single, Walters said it&apos;s obvious that initial purchase and following maintenance costs would be less. "I also believe that with a single engine you would be more inclined to do a better maintenance job," he says. On the negative side, Walters still has minor concerns about engine reliability. Despite that, he sounds like a vote for a single-with-thruster. Gilbert, despite about 20 years of singleengine operations, had no problem coordinating throttle and shift to make the twin spin in place. We were nearly done with this round of testing and Keith told Gilbert to make a starboard landing. That meant he had to back in. Following Keith&apos;s hints, Gilbert backed down with the port engine to set up the proper angle. Then he worked the engines forward and reverse and the boat backed in. "There it is," Gilbert says. "Easy does it with the twins." Despite the ease of working a twin, Gilbert says he&apos;ll remain forever faithful to a single and, perhaps, entertain the idea of putting a thruster into his classic old yacht. We could have gone out into Bellingham Bay and run some courses, but there is so little difference between a single and twin under those conditions that we did not. It would have been fun to toss a big buoy overboard and practice coming alongside and backing down onto it. We already had burned up half a day, and that kind of exercise would have represented only a refinement of skills demonstrated inside the breakwater. What we learned, of course, is that either kind of boat is fine, as long as the operator knows its operating quirks and can read the wind and currents and assess how they will affect a maneuver. Both Carolyn Blocher and Walters correctly said that anyone buying a single for the first time should also buy time with a professional skipper. That&apos;s the best way to learn the tricks. The first-time buyer of a twin-engine boat should heed the same advice. We agreed that a single-engine boat is cheaper to buy and to own. With less maintenance, there may be more time for cruising. We acknowledged that there are huge fleets of boats built with only one engine, and many of them without a bow thruster. Somehow, they all seem to get where they need to go. And it was obvious that people were most comfortable with boating systems they knew. Equally obvious, though, is that it&apos;s not hard to change. No votes were taken over lunch. But the singlewith- thruster had some staunch supporters and a couple who were leaning that way. So why buy a twin-engine boat? Good question.